Very few cities speak of the history of the 20th century in so much detail like Berlin does. 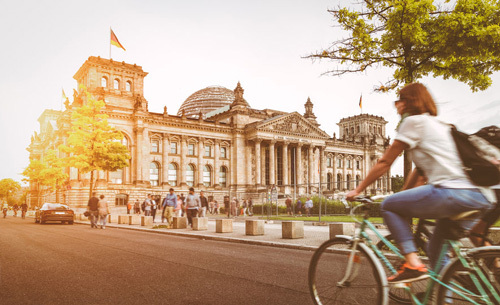 Berlin, the capital of Germany and one of the most multicultural cities in the world, was greatly affected by several wars in the past century. As such, this city stands as an important witness to the turbulent history of the continent, but also as a representative of a united, peaceful and diverse Europe. 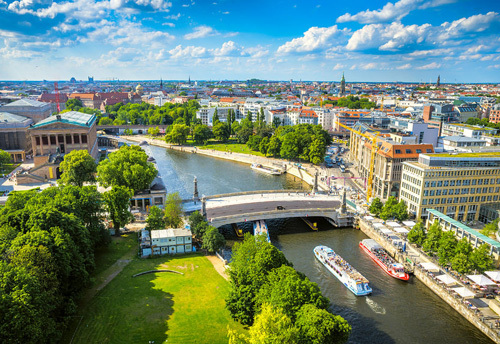 Berlin remained a small settlement for many centuries until it merged with the city of Colln, located on the other side of the Spree River. In the late 17th century, Berlin became famous as a haven for religious and economic refugees, which helped it develop further. In 1701, the city became the capital of Prussia. Until the beginning of the 20th century, its economy kept growing immensely. Having been defeated in World War I, Germany was forced to pay reparations, and this led the living standard to deteriorate. During World War II, Berlin was nearly burnt to the ground due to numerous bombings which resulted in Germany's defeat. After several decades of being a divided city, Berlin united and grew into one of the most prosperous places in the world. After World War II, Germany was divided amongst the winning powers. East Berlin subsequently fell into the hands of the Soviets, who installed a communist regime in the entire East Germany. The differences in the living conditions in these different parts of the city became visible really quickly, and the developed West became more attractive to people. To make sure nobody escapes from East Berlin, East Germans permanently closed the border between East and West by building a wall – now known as the Berlin Wall – which stretched through the entire city. The wall was constantly monitored by soldiers stationed in more than 300 watchtowers. Although the Wall was torn down in 1989 and East and West were united again, some remnants of the wall are still kept in the city and available for tourists to see. 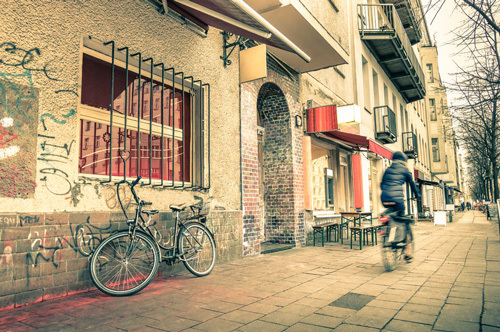 Nowadays, the former East Berlin has evolved into a vibrant cultural hub. This part of the city now gathers numerous artists, who paint on walls and organize exhibitions.  It is also where students and young people hang out. 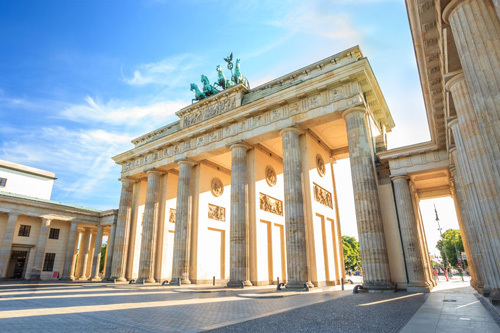 Although built in the 18th century on the orders of Prussian king Frederick to celebrate an important victory, the Brandenburg Gate has become a symbol of modern Berlin. When East and West Germany were divided, the gate actually became a part of the Berlin Wall and was incorporated into the border between two countries. For this reason, the Brandenburg Gate today is a proof of a unified Germany, but also as the best symbol of peace and prosperity in the whole of Europe. Being a rather central point in the city, the gate attracts great numbers of tourists. The Reichstag, located near the Brandenburg Gate, currently serves as the German Parliament building. The building was the center of German political power until 1933, when it was set on fire and severely damaged. After that, the building was not used for political purposes, and was only renovated and rediscovered in 1999. At the top of the Reichstag lies a large glass dome which offers a 360-degree view of Berlin cityscape. Prior registration is needed if you want to join one of the free tours of the building and should be made well in advance, particularly to visit the dome or the terrace. Berlin Cathedral, also known as Berlin Dom, is one of the most magnificent buildings in Berlin. Although it looks like its centuries old, the current building was only finished in 1905. Yet, the site of the cathedral has been an important place of worship since the 15th century. Its roof and windows were reconstructed after World War II, but the church interior still offers a number of older decorations and ornaments worth seeing. Paris has its croissants and Berlin has its pretzels. 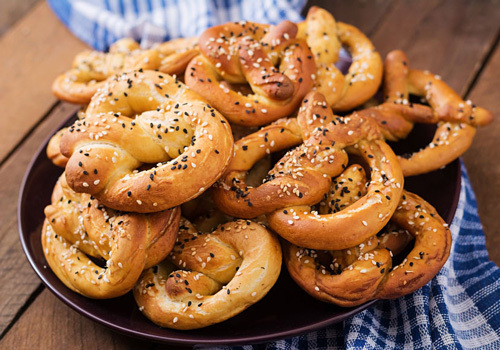 in German they are called brezel. 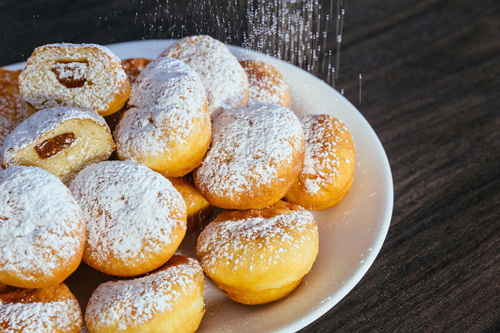 The Berliners (jelly-filled donuts), which are called pfannkuchen in Berlin, are the most popular pastry in Germany, especially around the carnival season (February/March). Another German classic is the Black Forest cake. It is named after the Black Forest area in Germany (a region with a forest that is so dense that it appears to be black from far), and features one of its main crops, cherries. 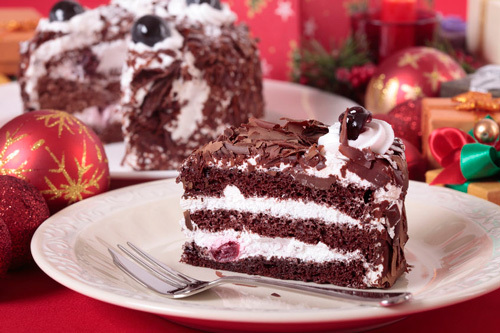 Typically, the Black Forest cake consists of several layers of chocolate cake, with whipped cream and cherries between each layer. 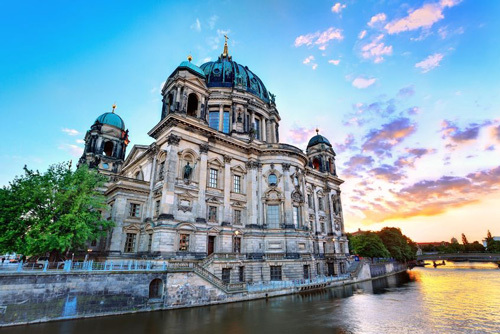 Berlin Cathedral has been a place of _________ since the 15th century. The Reichstag's was _________ on fire in 1933. East Berlin has evolved into a cultural _________. For several decades, Berlin was a _________ city. Reservations to enter the Reichstag should be made well _________. 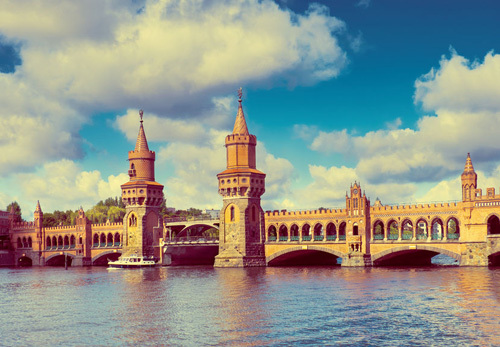 Berlin is an important _________ to the history of Europe. Some _________ of the Berlin Wall are still kept. East Berlin is where students _________. Soldiers were _________ in watchtowers along the wall. Heavy bombings of the city led to Germany's _________. Who helped Berlin develop rapidly in the 17th century? How can you see the Reichstag dome from the inside? What important monument was once a part of the Berlin Wall? Why was the Berlin Wall built in the first place? Because East Germans wanted to stop people from escaping to the West. Because West Germans wanted to stop people from escaping to the East. Because the royal family wanted to build it. East and West Berlin were separated by a wall but belonged to the same country. East and West Berlin belonged to two different countries until 1989. Berlin Cathedral has been well preserved since the 15th century. The site of the Berlin Cathedral originates from the 15th century, but not the building. "Today, West Berlin is much more popular among artists than East Berlin." "Tourists can see some parts of the Berlin Wall in their original form at different locations."